Welcome to Radio Free Stein, a project that stages the plays of Gertrude Stein in the medium of recorded sound. Our goals are to study Stein’s lesser-known theatrical work, to understand the relevance of music and sound to her poetics, and to expand ways of integrating words with other sonic elements. Here you can find original audio recordings, liner notes on productions, interpretations of the plays, and other resources on Gertrude Stein and sound. 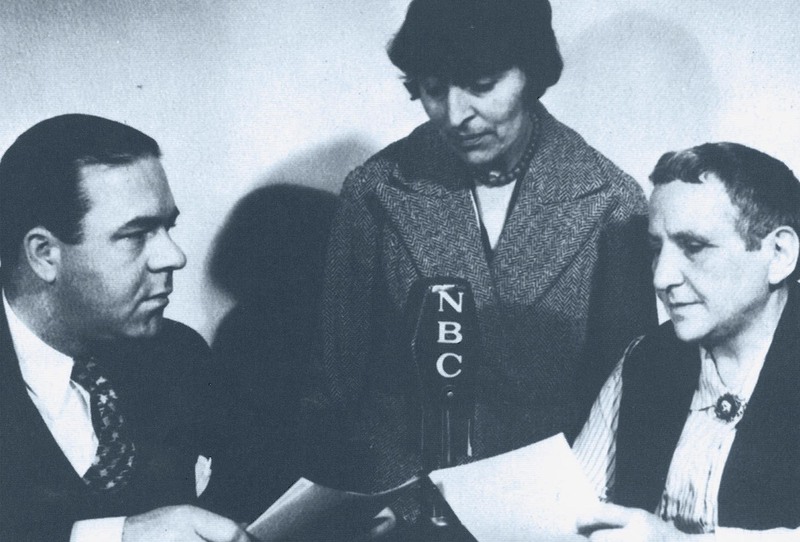 "Then we sat down one on either side of the little thing that was between us..."
Gertrude Stein interviewed by William Lundell for NBC Radio, November 12, 1934. Image courtesy of the Beinecke Library, Yale University. Radio Free Stein is a critical sound project that aims to render some of Gertrude Stein’s 100 plays into new radio form. Based at the University of British Columbia, the project involves poets and critics, composers and musicians, actors and directors, and sound artists and technicians in Vancouver, Atlanta, New York City, Montreal, Copenhagen, Paris, Amsterdam, and elsewhere. The project is committed to finding techniques for letting Stein’s writing make as much (and as many different kinds of) sense as it may, especially musical sense. Funded by an Insight Grant from the Social Sciences and Humanities Research Council of Canada, Radio Free Stein supports engagement with Stein’s writing and sound across disciplines and mediums. It offers resources to poets, theater artists, and composers; researchers, teachers, and students; and anyone for whom Gertrude Stein’s writing continues to be vital. © 2019 - Radio Free Stein. All Rights Reserved.